During the 1880s salt was discovered by chance on Walney whilst boring for coal. By the late 1890s Barrow Salt Works was a large operation. Brine was pumped from wells near Biggar Village to filter beds and a brine reservoir at Hillock Whins. It then went to an evaporation plant and salt pans located on the far south end of the island, which is now part of South Walney Nature Reserve. Over 50,000 tons of salt a year could be produced from these works. As demand grew, sea salt started being imported into Cumbria in larger quantities from places such as Liverpool, so smaller salt producing industries found it difficult to compete. 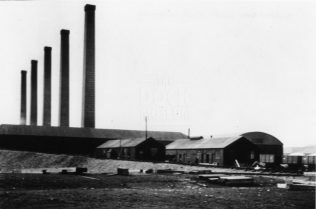 Barrow Salt Works closed in 1909. Today, very little remains of this once flourishing industry. At the southern end of Walney Island, the former evaporation plant has collapsed. In 2018 a photographic record was captured before this history fades away.